Human GABAergic interneurons (GIN) are implicated in normal brain function and in numerous mental disorders. However, the generation of functional human GIN subtypes from human pluripotent stem cells (hPSCs) has not been established. By expressing LHX6, a transcriptional factor that is critical for GIN development, we induced hPSCs to form GINs, including somatostatin (SST, 29%) and parvalbumin (PV, 21%) neurons. Our RNAseq results also confirmed the alteration of GIN identity with the overexpression of LHX6. 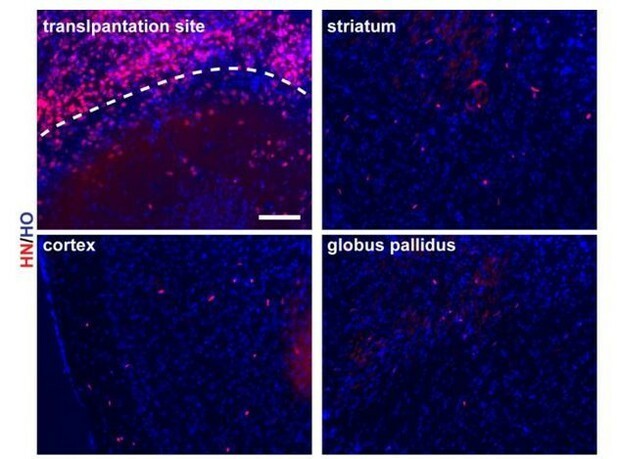 Five months after transplantation into the mouse brain, the human GABA precursors generated increased population of SST and PV neurons by overexpressing LHX6. Importantly, the grafted human GINs exhibited functional electrophysiological properties and even fast-spiking-like action potentials. Thus, expression of the single transcription factor LHX6 under our GIN differentiation condition is sufficient to robustly induce human PV and SST subtypes. GABAergic interneurons (GINs) form the major inhibitory system in the mammalian cortex (Molyneaux et al., 2007; Wonders and Anderson, 2006). There are many subtypes of cortical GINs that are differentiated on the basis of the expression of molecular markers, including calbindin (CB), calretinin (CR), parvalbumin (PV), and somatostatin (SST) (Wonders and Anderson, 2006). PV interneurons display a chandelier or basket morphology and have a fast-spiking property. They are essential for regulating emotion and learning (Hu et al., 2014). SST interneurons are characterized as Martinotti or non-Martinotti in morphology and play important roles in reducing epileptic form activity and in facilitating motor and spatial learning (Yavorska and Wehr, 2016). Dysfunction of PV and SST interneurons is involved in neurological and psychiatric diseases such as epilepsy, schizophrenia and autism (Fee et al., 2017; Marín, 2012; Hashimoto et al., 2003). Thus, the availability of human PV and SST GINs is important for cell-replacement treatment and for studies of disease etiology. Cortical GINs are primarily derived from the MGE (medial ganglionic eminence), which is located in the ventral forebrain during embryonic development (Kelsom and Lu, 2013; Hansen et al., 2013; Ma et al., 2013). The developmental process is orchestrated by a cascade of transcription factors, including DLX2, DLX5, NKX2.1, and LHX6, which is induced by the morphogen Sonic hedgehog (SHH) that is secreted by the notochord (Kelsom and Lu, 2013; Xu et al., 2005; Xu et al., 2008; Liodis et al., 2007; Flandin et al., 2011; Du et al., 2008). On the basis of this principle, approaches have been developed for generating human GINs from hPSCs by efficiently inducing MGE progenitors using sonic hedgehog (SHH) (Liu et al., 2013a), or SHH together with telencephalic inducers (Maroof et al., 2013; Nicholas et al., 2013; Kim et al., 2014). However, GINs expressing SST and PV are usually generated only after 100 days and relied on co-culture with rodent cortical neurons/astrocytes and cell sorting (Maroof et al., 2013; Nicholas et al., 2013). Recently, GINs have also been generated by overexpressing transcription factors, such as Ascl1 and Dlx2. Again, however, the populations of SST(~9%) and PV neurons are very low after 5 weeks of culture (Yang et al., 2017). Thus, efficient generation of human PV and SST interneurons from hPSCs is desirable for disease modeling using patient induced pluripotent stem cells ( iPSCs). In this study, we established human embryonic stem cell (ESC) and iPSC lines with inducible expression of LHX6. Differentiation of transgenic LHX6 hPSCs to GINs under our established GIN differentiation protocol (Yuan et al., 2015) significantly increased the percentage of PV and SST interneuron subtypes within 80 days when LHX6 is induced. Importantly, the PV and SST neurons that were generated following transplantation into the mouse brain exhibit increased population size and a fast-spiking-like electrophysiological property. We first established a human ESC (H9) line and an iPSC line (ihtc) with inducible expression of LHX6 by inserting, using TALEN-mediated targeting, a tet-on inducible cassette into the AAVS1 site (Qian et al., 2014). 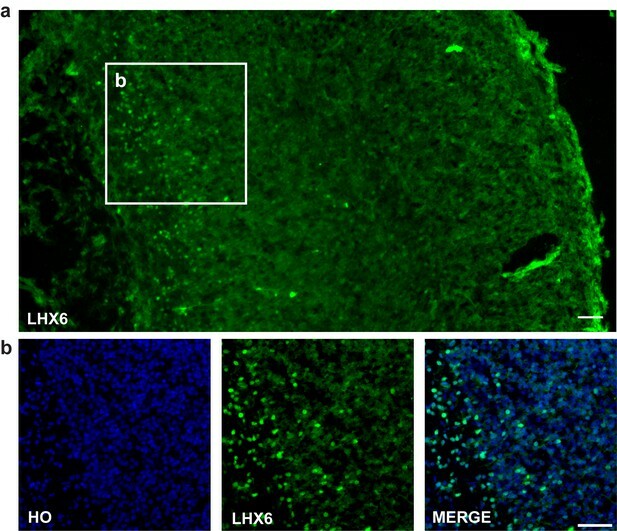 After electroporation, transgenic LHX6 hPSCs were selected by puromycin (Figure 1a). The transgenic colonies showed a morphology similar to that of the parental PSCs (Figure 1b). For the H9 cell line, 14 colonies were selected by puromycin treatment. And quantative real-time PCR (qPCR) experiments were performed to detect the expression levels of LHX6 mRNA after 3 days continuous induction with doxycycline (dox), which turns on the expression of LHX6 from the promoter. After induction, three of the 14 colonies (efficiency ~21%) showed high expression of LHX6 when compared with non-induced colonies. Furthermore, the expression of LHX6 was confirmed in one of these colonies (H9-01) by LHX6 immunostaining. The same experiment was performed on the ihtc cell line, and the ihtc-03 colony and two of eight colonies were shown to overexpress LHX6 (efficiency ~25%). The overexpression of LHX6 mRNA in colony ihtc-03 was confirmed by assessing the expression of LHX6 protein (Figure 1c). The H9-01 and ihtc-03 cell lines were then cultured and expanded for further experiments. Construction of inducible LHX6 OE hPSCs. (a) Schematic representation of electroporation to establish inducible LHX6 overexpressing (OE) hPSCs. (b) Bright-field images of hPSC colonies before and after electroporation. (c) After doxycycline induction, two inducible LHX6 OE hPSC cell lines expressed LHX6. Scale bar, 50 μm. (d) Schematic showing the differentiation of transgenic hPSC lines into dorsal neurons without adding morphogens. CON: default control group (−dox), LHX6 OE: LHX6 OE group (+dox). (e) mRNA expression levels for two transgenic hPSC-derived neurospheres and each control at day 17; n ≥ 3 for each cell line. (f–h) Representative images and quantification of transcription factors FOXG1 (f), PAX6 (g) and COUPTFII (h) expressed in CON and LHX6 OE neural precursors from two cell lines. In the absence of exogenous morphogens, human PSCs differentiate to a nearly uniform population of neural precursors with the dorsal forebrain identity (Li et al., 2009). We asked whether expression of LHX6 alters the identity of differentiated progenitors. When the transgenic hPSCs were differentiated to neural progenitors under the ‘default’ condition for 17 days (Figure 1d), the mRNA levels of the ventral transcription factors LHX6, LHX8, NKX2.1, and SHH were significantly increased, whereas the level of the dorsal transcription factor PAX6 decreased in the neural progenitors when LHX6 was induced (Figure 1e). Immunostaining of the neural precursors at day 25 indicated that both the LHX6-expressing and the parental PSC-derived neural precursors were positive for FOXG1 (Figure 1f), indicating that the expression of LHX6 does not alter the forebrain identity. Among LHX6 OE (LHX6 overexpression cells), however, the population of dorsal precursors that express PAX6 was decreased (H9-01 — 13% +dox vs 71% –dox; ihtc-03 — 37% +dox vs 84% –dox) (Figure 1g). The population of cells that express the caudal ganglionic eminence marker COUPTFII was dramatically decreased by LHX6 overexpression (28% of the H9-01 LHX6 OE vs. 50% of controls, and 36% of the ihtc-03 LHX6 OE vs. 59% of controls) (Figure 1h). Interestingly, Nkx2.1, a principle transcription factor that is involved in the specification of MGE progenitors (Xu et al., 2008; Du et al., 2008), was not detected in LHX6 OE groups. This may be explained by the fact that studies in mice have shown that Lhx6 lies downstream of Nkx2.1 (Elias et al., 2008). 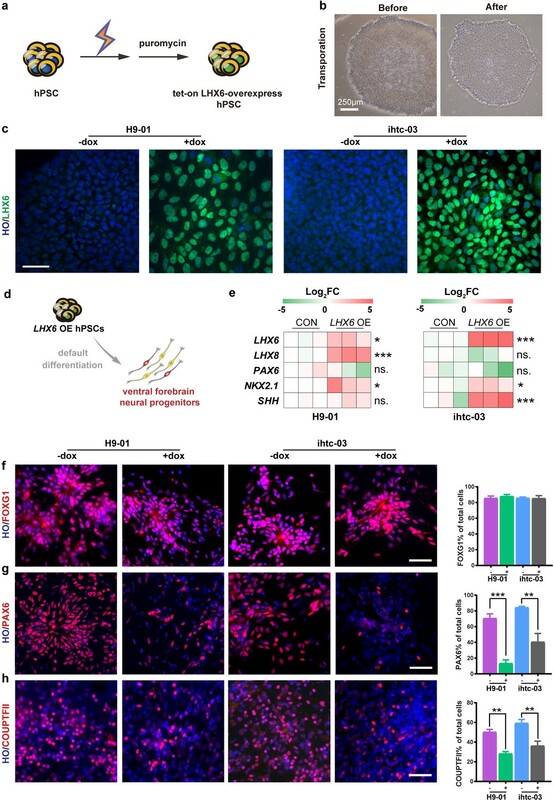 Together, the results indicate that LHX6 overexpression biases the forebrain neural progenitors to the ventral identity under the default differentiation condition. As differentiation to neurons progresses, or at day 35 from hPSC differentiation, the percentage of GABA-positive neurons in the LHX6 OE group was twice that in the control group (22% vs. 11% in H9-01 cells and 16% vs. 7% in ihtc-03 cells) (Figure 2a). Under the default differentiation scheme (without the presence of exogenous ventral inducers), there are usually no SST- or PV-positive neurons (Li et al., 2009). Indeed, we observed a few CB and CR neurons but no SST or PV neurons in the control group. By contrast, there are sizeable populations of SST and PV neurons, as well as CR, CB, and nNOS cells, in the LHX6 group (Figure 2b and c). Importantly, SST and PV neurons exhibited a more complex morphology, resembling multipolar cells (Figure 2d). We set the criterion of neurons having more than five secondary branches as morphology characteristic of SST and PV neurons. Most SST neurons have the characteristic morphology from day 45. About 30% of PV neurons have this characteristic morphology at day 80. Therefore, LHX6 is sufficient to promote the differentiation of GINs, including SST and PV subtypes, without the presence of SHH. LHX6 is sufficient to convert hPSC-derived dorsal neurons to GIN subtypes. (a) At day 35, immunostaining of TUJ-1 showed a similar efficiency of neuronal differentiation in all LHX6 OE groups and controls and a higher percentage of GABA+ cells in LHX6 OE cells. Scale bar, 50 μm. (b) The GIN subtypes calbindin (CB, day 35), calretinin (CR, day 45), somatostatin (SST, day 50), nNOS (day 80) were presented in the LHX6OE cells from two cell lines. Scale bar, 50 μm. (c) Quantification of CB+, CR+, SST+, and PV+ cells among the TUJ-1+ cells. Upper, H9-01 LHX6 OE; below, ihtc-03 LHX6 OE group. (d) SST and PV expression in the ihtc-03 LHX6 OE group. (e) Neurons expressing SST and PV interneurons showed a characteristic morphological structure with more than five secondary branches. Highly enriched GINs can be generated from hPSCs by patterning the progenitors with SHH, although the generation of subtypes, especially of SST and PV neurons, takes a long time and the efficiency is low (Liu et al., 2013a; Maroof et al., 2013; Cunningham et al., 2014). Given that LHX6 expression alone is sufficient to generate SST and PV neurons within 5 weeks of default differentiation, we asked whether LHX6 further enhances the generation of human SST and PV neurons when the progenitors are ventralized. We differentiated hPSCs into MGE-like progenitors in the presence of SAG, a small molecule that activates SHH signaling (Figure 3a). 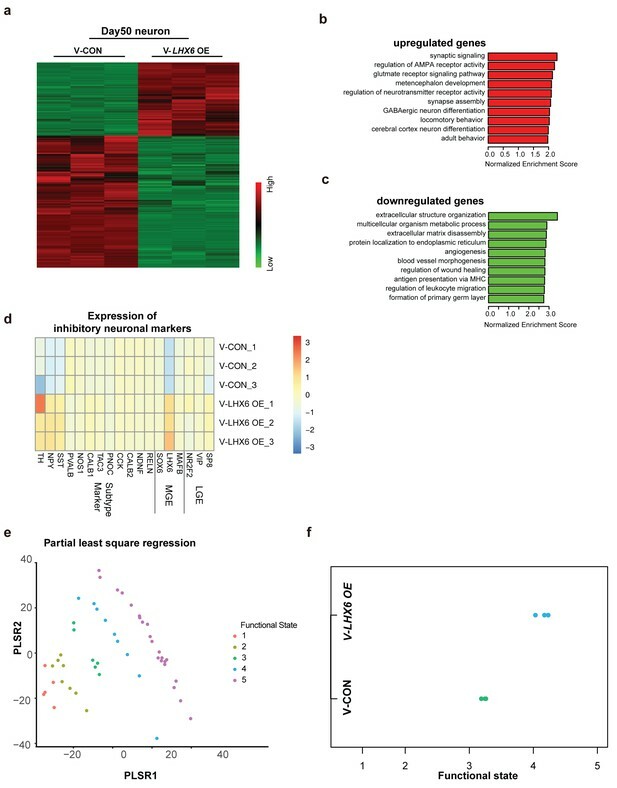 Upon induction of LHX6 expression with dox (ventral LHX6 overexpression group: V-LHX6 OE; ventral patterning group without dox: V-CON), the mRNA levels of LHX8 and SHH, but not of NKX2.1, were significantly increased in the two cell lines at day 17 (Figure 3b). Later, at day 25, we further confirmed LHX6 overexpression during the differentiation process and found that LHX6 OE groups expressed LHX6, while there was no expression of LHX6 in control groups (Figure 3c), as LHX6 is a post-mitotic marker that begins to be expressed at a relatively mature neuron stage (Vogt et al., 2014). With the activation of SHH signaling by SAG treatment, more than 80% of the cells in both the control and LHX6 OE groups showed expression of the MGE marker NKX2.1 at similar levels (Figure 3c and d). Similarly, the controls and LHX6 OE cell lines showed no significant difference in the expression of FOXG1 or OLIG2 (Figure 3—figure supplement 1a and b). Also, TUJ-1 and GABA expression did not differ between the V-CON and the V-LHX6 OE group. All groups generated similar proportions of GINs (about 80%) at day 35 (Figure 3c and e). 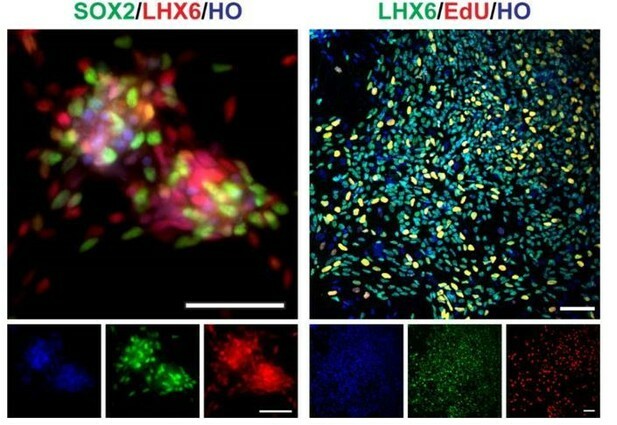 These results indicate that LHX6 OE does not alter the general GIN neurogenesis at an early stage. Generation of SST and PV subtypes by overexpressing LHX6 and ventral patterning. (a) Schematic showing the differentiation of ventral cells from transgenic hPSC lines after treatment with SAG. V-CON, ventral control group (−dox); V-LHX6 OE, ventral LHX6 OE group (+dox). (b) The mRNA expression levels of ventral transcriptional markers in three transgenic hPSC lines and in each control at 17 days post-differentiation; n ≥ 3 biological replicates. (c) The proportions of LHX6+ cells in the control and LHX6 OE groups. The NKX2.1, GABA, TUJ-1 groups all displayed high expression of LHX6 in both the H9-01 and ihtc-03 cell lines with or without dox. Scale bar, 50 μm. (d–e) Quantification of NKX2.1+ cells (d) and GINs (e). (f) Percentage of GINs in the ventral ihtc-03 LHX6 OE group. At least 1500 cells were counted from random selected fields in each cell line, n ≥ 3 for each cell line. (g) Immunostaining of GIN subtypes in the ventral ihtc-03 control (V-CON) and LHX6 OE groups. (h) Representative tracing images of three different types PV+ neurons (type I, 130/369; type II, 137/369; type III multipolar cells, 102/369). When examining the GIN subtypes, we found that at day 35, CB was expressed in 18% of total cells compared with 22% of cells in the control, with no significant difference between the two (Figure 3f). The CR- expressing population was maintained at 20–30% from day 35 to day 80 (Figure 3f). SST+ were initiated at day 45 with the LHX6 overexpression and PV+ neurons began to express at day 60. Notably, SST+ neurons dramatically increased to 29% of all neurons in the LHX6 OE group in comparison of 12% in the control, and PV+ neurons increased to 21% in the LHX6 OE group (Figure 3f) compared to <1% in the controls at day 85 (Figure 3g and f). Notably, the human PV+ neurons, which are induced by LHX6, pursued a multipolar structure with multiple neuritis beginning from the cell body (102 of 369 PV+ neurons) (Figure 3h). Similar percentages of GINs subtypes were observed in another LHX6 OE cell line (Figure 3—figure supplement 1c and d). Taken together, our results showed that LHX6 overexpression in MGE-like progenitors did not change the ventral telencephalic fate but enhanced the inhibitory interneuron cell fate to SST+ and PV+ neurons. To explore the effect of LHX6 on neural development and differentiation systematically, we performed RNA-sequencing (RNA-seq) of hPSC-derived GINs at day 50 in vitro. A total of 1303 upregulated genes and 2344 downregulated genes were determined with cutoffs of absolute log2 fold change ≥1 and adjusted p-value < 0.05 (Figure 4a). Among them, LHX6 expression had 7.338 log2 fold change leading the differential genes. The genes that were upregulated were enriched in those involved in biological processes that are critical for neuron maturation and differentiation, including synaptic signaling, neurotransmission and GABAergic neuron differentiation, whereas down-regulated genes were enriched in those with functions in biological processes involved in the maintenance of conditions for early neural development, such as extracellular structure organization and angiogenesis (Figure 4b and c). Integrative transcriptomic analyses of hPSC-derived GINs at day 50. (a) Heatmap showing relative expression of 3467 differentially expressed genes in V-LHX6 OE cells compared to controls. (b) Bar plot presenting the top 10 non-overlapping enriched gene ontology (GO) terms in upregulated genes. (c) Bar plot presenting the top 10 non-overlapping enriched GO terms in downregulated genes. (d) Heapmap of genes associated with lateral ganglionic eminence (LGE), MGE or subtype interneuron genes in our cells (Lake et al., 2016). (e) Functional order (1–3, immature; 4, transitional and 5, highly functional neurons) displayed by Patch-Seq single cell population samples when projected on the first and second partial least-square (PLS) regression components of single cell RNA-seq profiles. (f) Functional state of our samples predicted by the PLSC1 and 2 derived linear model. By comparing our expression data with those for regions of the human brain available in the Brain span Atlas of the Developing Human Brain, we confirmed that the gene expression of V-CON and V-LHX6 OE hiPSC-derived 50-day-old neurons most closely resembles that of the human first trimester brain cortex (Figure 4—figure supplement 1a and b). In addition, the gene expression of the V-LHX6 OE neurons appeared to be closer to that of to PCW 9–17 than that of the control neurons (PCW 8–9) (Figure 4—figure supplement 1a and b). Characterization of neural fate confirmed the inhibitory nature of our samples (Figure 4d), which showed the strongest correlation to neuronal subtypes of MGE origin. In comparing our data with those on neuronal transcription factors that had been identified before (Lake et al., 2016), we found that our samples resembled most inhibitory identities and that the LHX6 OE neurons were closer to inhibitory plots than control group (Figure 4d). To characterize the neuronal fate, we compared the gene expression profiles of our samples with the interneuron classifications. At day 50, SST mRNA showed a significant increase along with LHX6 gene expression. However, PV mRNA did not show anobvious change at this time point, which is understandable given that PV generation begins at a relatively late stage when compared with SST neuron generation. Considering the immature state of our samples, these results might imply that our neurons were in a stage of early development/differentiation characterized by a high capacity for neuronal migration. Prediction of the neural functional state of our samples implied that V-LHX6 OE neurons were more mature and functionally active than control neurons (Bardy et al., 2016), although neither acquires fully functional maturity in 50 days (Figure 4e and f). 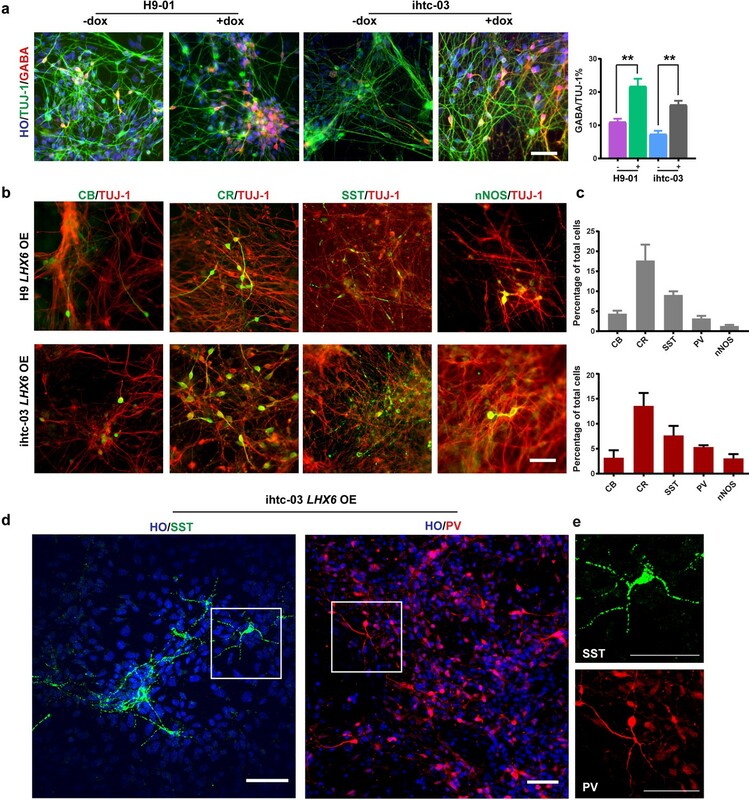 Taken together, our RNAseq results showed that the V-LHX6 OE hPSC-derived neurons resembled PCW 9–17 inhibitory neuronal identity, and that they were in a more mature state than the controls. To further investigate whether the population of human SST and PV interneurons could be enriched in grafts, we transplanted 7-week hPSC-derived MGE progenitors into the ventral forebrain of neonatal severe combined immunodeficiency (SCID) mice (Figure 5a). At 3 months post-transplantation, most grafted cells had become post-mitotic, and the NESTIN+ and KI67+ cells were rarely found (Figure 5—figure supplement 1a). Nearly 80% of hN+ cells were TUJ-1+ (Figure 5—figure supplement 1a), and most of them (74.92 ± 3.17% in the LHX6 OE group and 72.21 ± 1.91% in the control group) were GABA+ (Figure 5b). Notably, the percentage of LHX6+ cells among the grafted LHX6 OE cells, which maintained their identity in vivo, was higher than that among control cells at 3 months post-transplantation (Figure 5c). At 3 months post-transplantation, we found that the percentage of CR+ neurons was similar in the mice transplanted with LHX6 OE or in control cells. However, the percentage of SST+ neurons was higher while the percentage of CB+ neurons was lower in the mice transplanted with the LHX6 OE GINs than in controls (Figure 5e and f). Although the percentage of PV+ neurons in both groups was lower than that in other cell types in vivo, the number of human PV+ neurons in the LHX6 OE group (60 PV + cells among 4524 hN+ cells) was significantly higher than that in controls (31 PV+ cells among 6608 hN+ cells). Thus, the GINs that were generated by LHX6 OE promoted the generation of SST and PV neurons after transplantation into mice brain. Neonatal transplantation showed that overexpression of LHX6 increased the differentiation of SST and PV neurons. (a) Schematic showing the transplantation of hPSC-derived GABAergic progenitors into the basal forebrain of neonatal mice. 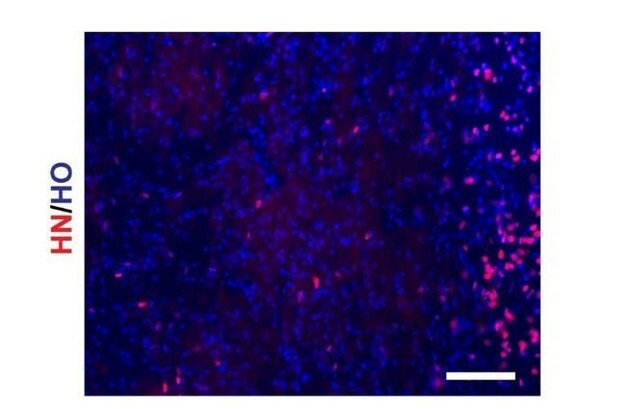 (b–c) Immunostaining of GABA (b) and LHX6 (c) co-labeled with hN in grafted cells at 3 months after transplantation. Scale bar, 50 μm. (d) Quantification of GABA+ and LHX6+ cells among hN+ cells. Over 6000 hN+ cells were counted; n = 4 for V-CON and n = 5 for V-LHX6 OE. (e) At 3 months after transplantation, all four GIN subtypes (CR, CB, SST, and PV) could be detected. Scale bar, 50 μm. (f) Quantification of GIN subtypes at 3 months after transplantation. Over 3000 hN+ cells were counted for each subtype; n = 4 for V-CON and n = 5 for V-LHX6 OE. Cortical SST neurons have several distinct kinds of firing properities, including regular-spiking, low threshold spike (LTS) and brusting firing patterns (Yavorska and Wehr, 2016). The characteristic feature of the cortical PV neurons is their fast-spiking action potentials (Hu et al., 2014). We assessed the membrane properties of our in-vitro-generated GIN subtypes using whole-cell patch-clamp recordings on enhanced green fluorescent protein (EGFP)-expressing neurons at 3 months and 5 months after transplantation (Figure 6a). We found a more negative resting membrane potential (RMP) and reduced input resistance in grafted neurons at 5 months compared to 3 months (Figure 6b,c). Action potential (AP) thresholds were not significantly different between the two time points (Figure 6d), but AP amplitude and fast after-hyperpolarization (fAHP) were increased in the 5-month grafted neurons in comparison with 3-month grafted neurons (Figure 6—figure supplement 1). These results suggest that the grafted neurons became more mature in vivo as the post-transplantation survival time is prolonged. Grafted neurons show functional maturation and fast-spiking-like interneuron high-frequency firing in vivo. (a) Representative image of an LHX6-EGFP OE cell at 5 months after in vivo transplantation. The cell was recorded with whole-cell configuration and then filled with neurobiotin. The recorded cell was visualized with EGFP (left, red arrow) and differential interference contrast microscopy (DIC) (middle) and was reconstructed via neurobiotin staining (right). (b–d) Summary of resting membrane potential (RMP) (b), input resistance (c), and action potential (AP) threshold (d) from LHX6-EGFP OE cells at 3 months and 5 months after transplantation. ***, p<0.001. (e) Sample traces of voltage changes in an LHX6-EGFP OE cell. Changes of membrane potential were evoked by current injection in 0 pA and 190 pA, respectively (left). Spontaneous firings of an LHX6-EGFP OE cell at a subthreshold holding of −44 mV. (f) Sample traces of voltage changes in a LHX6-EGFP OE cell. Changes of membrane potential were evoked by current injection in 0 pA and 160 pA (left). The recorded cell could fire action potentials at a maximus rate of 40 Hz. Spontaneous firings of an LHX6-EGFP OE cell at a subthreshold holding of −38 mV (right). (g–h) Sample traces of spontaneous postsynaptic currents (sPSCs) at a holding potential of −70 mV (g) and −40 mV (h) from an LHX6-EGFP OE cell at 5 months after transplantation. The bottom three traces are enlarged from the top traces. (i–j) Summary of frequency (i) and amplitude (j) of sPSCs recorded at a holding potential of –70 mV from LHX6-EGFP OE cells at 5 months after transplantation. At 5 months post-transplantation, 6 of the 12 recorded grafted human neurons showed regular-spiking firings as well as an adaptation in neuronal firings (Figure 6e), which are the characteristics of neuronal firing for SST interneurons (Yavorska and Wehr, 2016). Notably, the rest of the recorded neurons (6 in 12 neurons) displayed fast-spiking-like firings and non-adaptation in neuronal firings as well as deep fAHPs (Figure 6f), which is thought to be typical of PV interneurons (Nassar et al., 2015; Povysheva et al., 2013). Next, we examined whether grafted human neurons have been innervated by endogenous neurons in the mouse brain. Spontaneous postsynaptic currents (sPSCs) were recorded for the 5-month grafted human neurons at holding potentials of −70 mV and −40 mV. As we expected, grafted neurons received robust inputs from other neurons in vivo with a spontaneous postsynaptic current (sPSC) frequency of 0.40 ± 0.076 Hz and an amplitude of 14.2 ± 0.62 pA at a holding potential of −70 mV (Figure 6g,i,j). It is worth noting that most synaptic inputs on grafted neurons are GABAergic inhibitory because a large number of the sPSCs became upward at a holding potential of −40 mV maintained using a recording pipette solution containing Cl– with a reversal potential of −79 mV (Figure 6h). These results suggest that the grafted human neurons were fully functionally integrated into the existing endogenous network in the mouse brain 5 months after transplantation. Here, we describe the application of a single transcription factor, LHX6, in combination with the SHH activator to robustly generate PV and SST interneuron subtypes from hESCs and iPSCs. A cell population in which PV and SST neurons together made up nearly 50% of the population could be yielded with stable LHX6 overexpression and ventral patterning. Differentiation of human cortical interneurons in vitro follows the principle of early generation of CB and CR neurons and late generation of SST and PV neurons (Cao et al., 1996), which is consistent with the human fetal tissue research showing that SST and PV expression has been found at the beginning of middle-late gestation (Zecevic et al., 2011). Effective generation of human GINs (75–90% efficiency) has been reported by several groups, including ours (Liu et al., 2013a; Maroof et al., 2013; Nicholas et al., 2013). 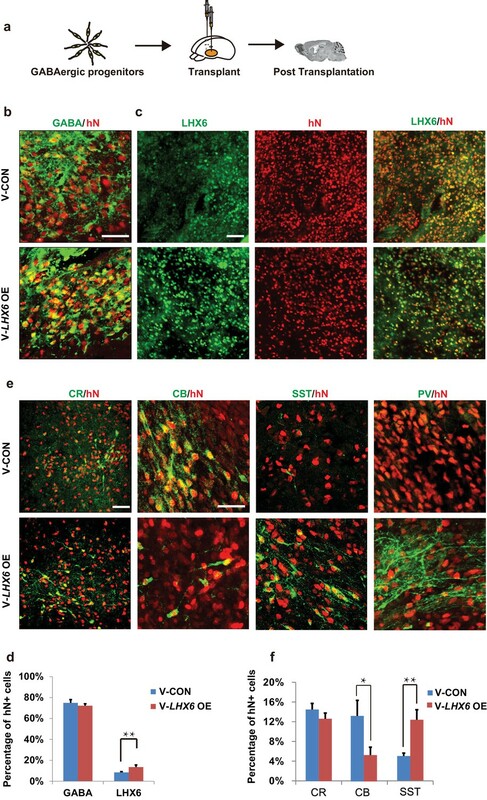 However, the generation of PV and SST neurons was low in those studies and required co-culture with rodent cortical glial/excitatory neurons after fluorescence-activated cell sorting (FACS) (as listed in Supplementary file 1). The main reason may be the late and low-level expression of the LHX6 protein (Maroof et al., 2013; Nicholas et al., 2013). Our study provides a simple method to yield transplantable SST and PV interneurons in vitro, without the need for cell sorting or a co-culture system, indicating the that the expression of LHX6 is sufficient for the induction of SST and PV neurons. Recently, LHX6 was reported to be one of the inducers for converting non-neuronal cells into GINs (Yang et al., 2017; Colasante et al., 2015; Sun et al., 2016) in vitro (Supplementary T1). Three factors (Ascl, Dlx2, and Lhx6) together with miR-9/9*−124 induced hESCs/iPSCs to become GINs (including the CB, CR, SST and Never Peptide Y (NPY) subtypes), but few PV neurons were observed at day 70 post-differentiation, without the treatment of ventral inducers (SHH or SAG) (Sun et al., 2016). In another study, the expression of ASCL1and DLX2 were induced in the hPSCs for 5 weeks to generate GINs (Yang et al., 2017). However, the expression of PV neurons was not detected. In our research, we found that LHX6 alone was able to regulate the generation of SST and PV interneurons from hESCs/iPSCs with or without the treatment of the ventral inducers. In summary, our current study indicated that LHX6 alone is essential and sufficient to enrich the population of PV and SST GIN subtypes, providing an efficient method for producing human PV/SST neurons in vitro. Our method offers the possibility to study the etiology of PV-/SST-relevant psychiatric diseases and drug discoveries. hESCs (H9, Passage 40–60, WiCell Agreement NO.16-W0060, mycoplasma contamination testing see Supplementary T4) and iPSCs (ihtc, Passage 10–20, established in our laboratory) were maintained on vitronectin-coated plates (Life Technologies) with Essential eight medium, which was changed daily. Cells were passaged every 5 days through ethylenediaminetetraacetic acid (EDTA) (Lonza) digestion. For neural differentiation, hPSCs were detached by dispase (Life Technologies) to form embryoid bodies (EBs) and then cultured in neural induction medium (NIM) as previously described (Yuan et al., 2015). After floating for 7 days, EBs were attached on vitronectin-coated surfaces. Rosette structures could be observed at day 10–16. At day 16, rosette clones were detached manually with a 1 ml pipette. Non-neuroepithelial clones were removed at this stage. Neurospheres were continuously floated in NIM and then dissociated by TrypLE (Life Technologies) and plated on vitronectin (Life Technologies) and poly-l-ornithine (Sigma) pre-coated coverslips for further neuronal differentiation. For dorsal differentiation, no morphogen was added. For ventral differentiation, 500 nM SAG was added from day 10 to day 25. In all in vitro experiments examining the induction of LHX6 overexpression, dox was added at 3 μg/mL from day 10 to day 25 for continuous treatment. hPSCs were maintained under feeder-free conditions. hiPSCs or hESCs were treated with Rho Kinase (ROCK) inhibitor 2 hr before electroporation. Cells (1 × 106) were dissociated into single cells by treating with EDTA for 5 min in an incubator and then were mixed with plasmids (OE: 20 μg donor plasmid and 5 μg TALEN arms) using the Lonza Nucleofector kit (VPH-5002). The cell mixture was electroporated in a Lonza Nucleofector 2b with the A023 program. After electroporation, the cells were quickly reseeded onto a vitronectin-coated six-well plate in Essential eight medium with ROCK inhibitor added for the first 24 hr. Stable colonies were selected after 5–7 days of continuous 0.5 μg/μl puromycin treatment. Cells cultured on coverslips were fixed in cold fresh 4% paraformaldehyde for 30 min and rinsed three times with phosphate buffered saline. Cells were treated with 0.2% TritonX-100 for 10 min and blocked in 10% donkey serum for 1 hr (brain slices: 0.5% TritonX-100% and 5% donkey serum for 1 hr). Cells/brain slices were incubated at 4°C overnight in primary antibody diluted with 0.1% triton and 5% donkey serum. On the second day, cells/brain slices were incubated in secondary antibody diluted in 5% donkey serum for 30 min at room temperature. Coverslips were mounted for fluorescent imaging solution. The primary and secondary antibodies are listed in Supplementary T2. Total RNA was extracted in Trizol reagent (Invitrogen) as previously described (Liu et al., 2013b), and cDNA was reverse-transcribed by using the SuperScript III First-Strand kit (Invitrogen). RT-PCR was performed using the Bio-Rad MyiQ real-time PCR detection system. The primers used are listed in Supplementary T3. SCID mice were purchased from the Model Animal Research Center of Nanjing University. All of the animal experiments followed standard experimental protocols and were approved by the Animal Care and Use Committee at Nanjing Medical University. The postnatal day (P0) SCID pups were randomly divided into two groups and were injected with 1 μl of day-35 V-CON/V-LHX6 OE MGE-like precursors at a density of 1.5 × 105 cells/μl. hPSC-derived precursors were broken into little clusters using a Pasteur pipette technique, which yielded small spheres with diameters of around 30 μm 2–3 days before transplantation (Liu et al., 2013b). Cells were suspended in 10–20 μl NIM with B27 (Life Technologies) and penicillin (Life Technologies) on the day of transplantation. Both hemispheres of each neonatal pup were injected with 1 μl cell suspension using a glass micropipette. The injection site was located in the basal forebrain, in the middle between bregma and interaural line, about 1 mm lateral to the middline, at approximately 3 mm depth (Xu et al., 2010). After injection, the pups were laid on a pre-warmed cushion for 15 min and then were returned to their cage. Whole RNA-sequencing analysis was performed by the Beijing Genomics Institute. Control cells were ventralized with SAG. Day-50 neurons from the V-CON/V-LHX6 OE groups were collected in Trizol. Total RNAs were extracted from the Trizol, and the single-end (50 bp) sequencing was performed on a HiSeq2000 platform (Illumina). RNA-seq reads were aligned to the human genome (GRCh37/hg19) using the software HISAT2 (DOI: 10.1038/nmeth.3317). Transcript abundance was quantified as FPKM (fragments per kilo base of exon per million fragments mapped). Differentially expressed genes were determined by DESeq2 (DOI: 10.1186/s13059-014-0550-8). Enriched Gene Ontology (GO) terms were identified with GSEA (DOI: 10.1073/pnas.0506580102). The brains of 3-months or 5-months post-transplantation mice were removed and sliced into 350 µm coronal sections in ice-cold NMDG (N-Methyl-D-glucamine)-containing solution consisting of (in mM): 93 NMDG, 93 HCl, 2.5 KCl, 1.2 NaH2PO4, 30 NaHCO3, 20 HEPES, 25 glucose, 5 sodium ascorbate, 2 thiourea, 3 sodium pyruvate, 10 MgSO4 and 0.5 CaCl2, pH 7.35 bubbled with 95% O2/5% CO2 using a Vibratome 2000 (Leica Microsystems). Slices were incubated at 34°C for 10–15 min in oxygenated NMDG solution and then transferred to the artificial cerebrospinal fluid (ACSF), which contained (in mM): 126 NaCl, 4.9 KCl, 1.2 KH2PO4, 2.4 MgSO4, 2.5 CaCl2, 26 NaHCO3, and 10 glucose, pH 7.4 at room temperature for about 0.5–1 hr before being transferred to a recording chamber containing ACSF bubbled with 95% O2/5% CO2 at 32°C. An upright fixed stage microscope (Olympus) equipped with epifluorescence and infrared-differential interference contrast (DIC) illumination, a charge-coupled device camera, and two water immersion lenses (10X and 60X) were used to visualize and target GFP-positive grafted cells. Glass recording electrodes (10–15 MΩ resistance) were filled with an intracellular solution consisting of (in mM): 136 K-gluconate, 6 KCl, 1 EGTA, 2.5 Na2ATP, 10 HEPES (295 mOsm, pH = 7.25 with KOH). Whole-cell patch-clamp recordings were performed using an Olympus microscope (BX51WI) and data were collected and analyzed using the Axopatch1500B amplifier and pCLAMP10 software (Molecular Devices). Neurobiotin tracer (Vectorlabs, SP-1120) was delivered into cells for the identification of cell morphology through recording pipettes. Membrane potentials were maintained at around −70 mV, and a series of step currents with incremental amplitude (10 steps, with 10 pA or 5 pA increment) were injected to elicit action potentials. Input resistance was calculated from the slope of a current-voltage plot of the change in membrane voltage evoked by a series of current injection steps in 10 pA increments. Data analysis was performed using Clampfit and GraphPad. After recording, brain slices were postfixed with 4% paraformaldehyde overnight, and were then subjected to immunostaining for neurobiotin (Alexa Fluor 647 Streptavidin, S21374). Images were acquired using an Eclipse 80i fluorescence microscope and a ZEISS LSM 700B confocal microscope. The quantification of fluorescent images was analyzed by Image J. For each cell line, more than 1500 cells for each index were counted, and at least three duplications were performed in each experiment. The number of nuclei labeled by Hoechst in each field was referred to as the total cell number for in vitro experiments, and the number of nuclei labeled by hN was referred to as the total grafted cell number in the transplantation experiment. More than 2000 hN+ cells were counted in each index (n (V-CON) = 4, n (V-LHX6 OE)=5). Data were compared by Student’s t-test, one-way ANOVA, and two-way ANOVA. All graphical data were presented as mean ± SEM. Values were considered statistically significantly different at p<0.05(*), p<0.01(**), and p<0.001(***). The Journal of Neuroscience 23:6315–6326. Frontiers in Neural Circuits 9:20. Frontiers in Neural Circuits 10:76. Thank you for submitting your article "Induction of human SST and PV neurons by expressing a single transcription factor LHX6" for consideration by eLife. Your article has been reviewed by two peer reviewers, one of whom is a member of our Board of Reviewing Editors, and the evaluation has been overseen by K VijayRaghavan as the Senior Editor. The reviewers have opted to remain anonymous. In this study, Yuan et al. 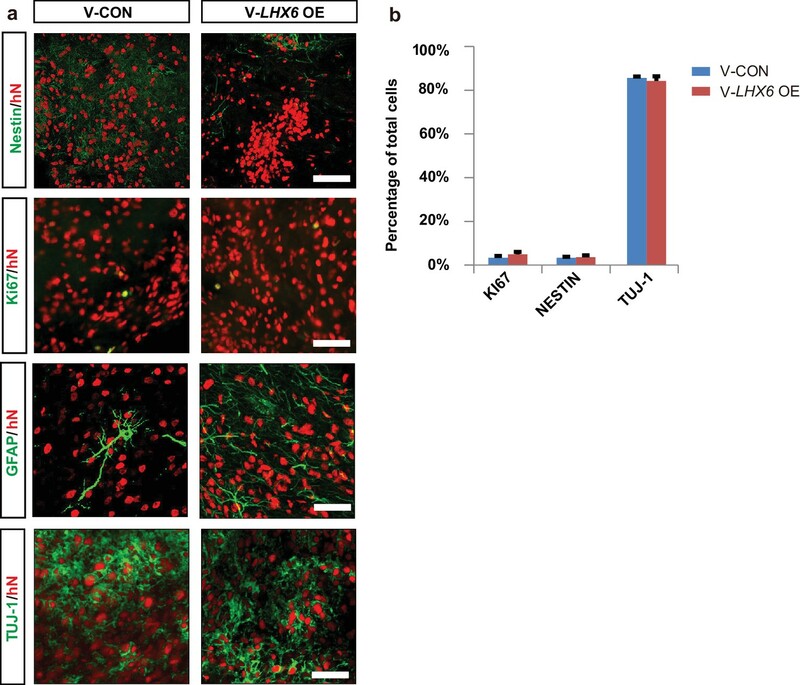 describe the generation of somatostatin (SST) and parvalbumin (PV) GABAergic interneurons from human pluripotent stem cells (hPSC) using a directed differentiation approach based on overexpression of LHX6. These two types of interneurons play significant roles in neurological and psychiatric disorders, so the availability of a cell culture model system to study their function could represent an important advance in the field. It has been difficult to produce these types of interneurons using either reprogramming or directed differentiation of hPSC. The authors describe a relatively efficient system for production of the cells, and characterize the neurons through RNA-seq, immunofluorescence microscopy, transplantation in vivo and electrophysiological recording. 1) Subsection “LHX6 promotes the generation of GINs” Figure 2B – what are the actual proportions of these cell types in control cultures? 2) Subsection “LHX6 promotes the generation of GINs” Figure 2B – the cell types that were counted make up at most 40% of the total. Do the authors know what the remaining cells represent? 3) Figure 2D – what proportions of SST and PV positive cells develop the characteristic morphology as shown? 4) Figure 4 – were the controls for this study ventralised with SAG? 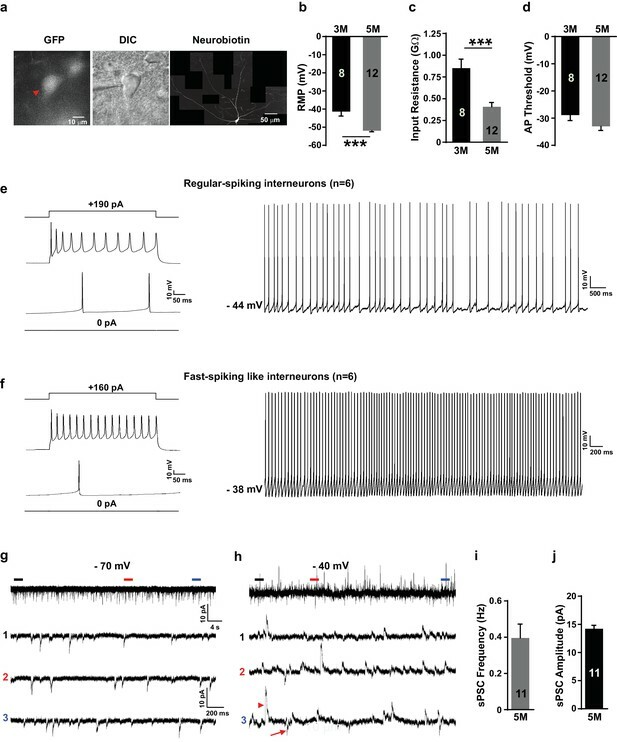 5) Subsection “Grafted neurons display characteristic firing patterns in vivo” – a reference to the electrophysiological properties of SST and PV neurons is missing. (Life Technologies) to form embryoid bodies (EBs) and then cultured in neural induction medium (NIM) as previously described." What is the reference? 7) "dox was added at 3 μg/mL on day 10" – was this continued or just a one-day treatment? It is mentioned that in some experiments dox was continued from day 10 to day 25, but for some other experiments it is not clear. 8) "hPSC-derived progenitors were broken into little clusters with diameters of around 30 μm 2-3 days before transplantation". This statement needs clarification as to what is meant by "broken into" – was this done at a passage, what exactly was the procedure? On a related note, are the cells mitotic, and if so for how, after forced Lhx6 expression? While it has not been definitively shown for human, in mice Lhx6+ cells are post-mitotic and thus would not be referred to as "progenitors", but could be referred to as post-mitotic precursors. 9) "The injection site was located at the basal forebrain." This needs to be defined more precisely with coordinates. 10) The specificity of the Lhx6 antibody needs to be established. Same for the Foxg1 antibody, and the hN antibody. 11) Figure 3H. and also text referring to Figure 2. There is nothing distinctly chandelier like about dendritic morphology. The chandelier interneuron is defined by its distinctive axo-axonic targeting onto the initial segment of pyramidal neuron axons. Unless axo-axonic targeting is shown any mention of chandelier cell in results in a misrepresentation of the data. 12) Figure 5. What was the protocol used in this experiment regarding duration and timing of dox? 13) Where are the cells – in striatum? There are PV+ and Lhx6+ GABA projection neurons in the globus pallidus – could some of these transplanted cells have this fate? 14) The histology in Figure 5 looks odd – it seems that nearly all cells in the field express hN, but if these were "real" mge-like interneuron precursors they should migrate and disperse. Perhaps they need to try making transplants earlier in the protocol? Place them in the neocortex? 15) The trace in Figure 6 appears to be about 20Hz. This is not typically considered fast-spiking, which should be 40+ Hz in vitro. 16) It seems as though cells were cultured without pyramidal neurons. If that is the case any apparent PV expression is a bit hard to interpret since PV is at least partially activity dependent, depending on NMDA activation and ERBB4, for example, which one might not expect to see in monocultures of GABA cells. Please clarify. In control cultures, CB+, PV+ or SST+ cells were barely observed. CR+ neurons was yielded about 10% population. The proportion of interneuron subtypes are low without ventral patterning factors (SHH), which is understandable since default differentiation mostly generate glutamatergic projection neurons. Since we do not add any ventral patterning factors, the remaining cells should be glutamatergic neurons and neural progenitor cells since there are still 20-40% cells express dorsal forebrain marker PAX6+ at beginning (Figure 1G in manuscript). Identity of neural progenitors was also confirmed by SOX2 staining. Besides, the cortical marker TBR2 (day 50) and glutamatergic neuron marker vGlut1 (day120), (Author response image 1). In this circumstance, the remaining cells were neural progenitors and glutamatergic neurons. Cells in LHX6 OE group expressing SOX2, TBR2 and vGlut1 (scale bar, 100μm) (related to Figure 2 in manuscript). We set the morphology that the neuron having more than 5 secondary branches as characteristic morphology. About 74% (193 of 261 SST+ neurons) of SST neurons have the characteristic morphology at day 45. About 30% of PV neurons (32 of 106 PV+ neurons) have the characteristic morphology at day 80. Description of “We set the morphology that the neuron having more than 5 secondary branches as characteristic morphology. Most SST neurons have the characteristic morphology since day 45. About 30% of PV neurons have the characteristic morphology at day 80.” was added in the manuscript. We apologize for the misunderstanding. Yes, the controls were ventralised with SAG. We added the description “Control cells were ventralised with SAG.” in this revision. We apologize for missing the reference. Reference was added in this revision (Hu, Gan, and Jonas, 2014). We apologize for missing the reference. Reference was added in this revision (Yuan et al., 2015). We apologize for the confusion. The treatment was continued to turn on LHX6 overexpression from day 10 to day 25, which was consistent in all experiments. We added description “In all in vitro experiment of induction of LHX6 overexpression, dox was added at 3 μg/mL from day 10 to day 25 for continuous treatment.” in the revision. The statement “broken into” means that we use Pasteur pipette technique for triturating neurospheres into small clusters instead of passage. We flame the end of a cotton-filtered Pasteur pipette and make the opening to 0.2-0.5mm in diameter. And then we used Pasteur pipette to break the sphere into small clusters with diameters of around 30 μm instead of passage (Liu et al., 2013). Yes. After we forced the expression of LHX6, part of the cells still are mitotic. We found there were a proportion of cells co-express SOX2/ LHX6 at day 35, and EdU/LHX6 on day 50 inside the clusters (EdU treatment with 12 hours) (Author response image 2). It suggested that the cells might be a mixture population of progenitors and post-mitotic precursors. And thanks for the reminder, we changed LHX6 related description "progenitors" to "precursors" in this revision. SOX2, LHX6, EdU staining of day35 V-LHX6 OE cells (scale bar, 100μm). Thanks for the comment. The description has changed to“The injection site was located at the basal forebrain, in the middle between bregma and interaural line, about 1 mm lateral to the midline, approximately 3mm depth”, which was adapted from Xu et al., 2010. Lhx6 antibody is a kind gift from Dr. Yang Zhengang (Institute of Brain Science at Fudan University). And the antibody specificity was established by E18.5 mouse forebrain immunostaining (Author response image 3A and B). Besides, we also adapted a figure of LHX6 staining for E13.5 mouse forebrain from Dr. Yang Zhengang’s paper to establish the specificity of Lhx6 antibody (Author response image 3B) (Z. Liu et al., 2018, Cereb Cortex). (a–b) LHX6 staining of E18.5 mouse forebrain cortex (scale bar, 100μm). 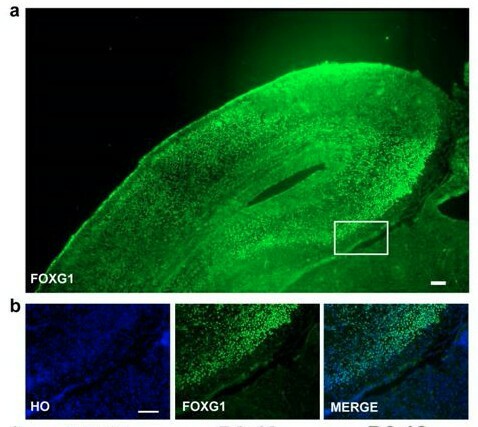 FOXG1 antibody specificity was confirmed by E18.5 mouse forebrain (Author response image 3A and B). Besides, in our previous study, the same FOXG1 antibody was used to clarify the characteristic of forebrain (D6-12, FOXG1 positive) and midbrain (D1-12, FOXG1 negative) cells that derived from hESCs (Xi et al., 2012, Stem Cells. 2012 Aug; 30(8): 1655–1663). Also, the antibody was widely used in other studies including ours (Kim et al. 2014; Renner, Lancaster et al., 2017, The EMBO Journal;Liu et al., 2013). (a–b) FOXG1 staining of E18.5 mouse forebrain (scale bar,100μm). Human nuclei antibody specificity was confirmed by human grafted cells in mouse brain slice. Only the grafted human cells expressed human nuclei, but the mouse endogenous cells are negative for human nuclei. Besides, this antibody is used by many transplantation studies (Guan et al., 2013, Biomaterials, 34(24), 5937-5946; Ma et al., 2012, Cell Stem Cell, 10(4), 455-464; Yang et al., 2010, PLOS ONE, 5(10), e13547; Liu et al., 2013,). hN staining of transplanted mouse brain slice (scale bar, 100μm). We apologize for the misrepresentation. We have changed the description “chandelier” to “multipolar” in the revision. 12) Figure 5. What was the procotol used in this experiment regarding duration and timing of dox? The cells used in transplantation followed the ventral differentiation protocol in vitro (as described in Figure 3). LHX6 OE group cells was treated with 3ug/ml from day 10 to day 25. 13) Where are the cells – in striatum? Based on our data, most of the transplanted cells tend to disperse from the transplantation site after 3 months transplantation, as shown in Author response image 6. Some of the cells migrated out of the transplantation site (Author response image 6). There were scattered grafted cell in striatum as well as in cortex. 3 months mouse brain slices (scale bar, 100μm). There are PV+ and Lhx6+ GABA projection neurons in the globus pallidus – could some of these transplanted cells have this fate? We observed sparse grafted cells in globus pallidus (Author response image 6). However, we did not see PV+ and Lhx6+ colabeled cells. We apologize for making the confusion. Most images we presented in Figure 5 are in the transplantation site that making it seems like nearly all cells in the field express hN. We add images that co-staining HO and HN at transplantation site to make it clear that not all the cells are positive for HN (Author response image 6). Furthermore, related to question 13, a lot of grafted cells migrated out of the graft site (Author response image 6). Thanks for the comments. Interneurons that fire action potential above 40 Hz are typically defined as fastspiking interneurons, so that we have named them as “fast-spiking-like firing” in the context. Besides, PV neurons might take longer time to be functional mature than other GABAergic interneurons subtype since PV neurons expressed at late term gestation in human fetal tissue (Zecevic, et al. 2011). For PV expression, it might be directly driven by LHX6-overexpression even without pyramidal neurons. Lhx6 might function to directly drive the specification of PV and SST neurons (Du et al., 2008). For activity part, we agree that “PV is at least partially activity dependent”. In our system, activity could at least come from three ways: (1) since GABA is excitable in the newborn neurons (Ben-Ari, 2002, Nat Rev Neurosci3(9): 728-739; Rivera, Voipio et al. 1999, Nature, 397: 251), GABAergic synapses that form among interneurons are the driver for neural activity; (2) our data showed that newly generated interneurons displayed a relative more positive resting membrane potential (around 40 mV, Figure 6B), where neurons could get excited more easily; (3) vGlut1 staining of day120 cells in V-LHX6 OE group revealed that there was a small amount of excitatory inputs in our system which could trigger the PV activity (less than 1%). V-LHX6 OE neurons also received a small amount of excitatory inputs by vGlut1. We thank Dr. Zhang Zhengang (Institute of Brain Science at Fudan University) for kindly providing the LHX6 antibody and Dr. Su-Chun Zhang (Waisman Center and WiCell Research Institute at the University of Wisconsin) for kindly providing the AAVS1-TALEN plasmids. This study was supported by the Strategic Priority Research Program of the Chinese Academy of Sciences (Grant No. XDA16010306), the National Natural Science Foundation of China (Grants 81471301 and 31671063), the National Key Research and Development Program of China (2016YFC1306703), the Jiangsu Outstanding Young Investigator Program (BK20160044), the ShanghaiTech Start-up Foundation and the Jiangsu Province’s Innovation Program, Postgraduate Research and Practice Innovation Program of Jiangsu Province. Human subjects: H9 cell line was purchased from Wicell Agreeement (NO.16-W0060) For ips cell line, verbal and written consent was obtained from the person. The study was approved by the ethic community of Nanjing Medical University(NO.217). Animal experimentation: SCID mice were purchased from the Model Animal Research Center of Nanjing University. All of the animal experiments followed standard experimental protocols and were approved by the Animal Care and Use Committee at Nanjing Medical University (IACUC-1601129). © 2018, Yuan et al.